The foundations of the Mission of Harvest Evangelism (H.K.) Ltd was built when Dr. Ed Silvoso, Founder & President of Harvest Evangelism Inc. came and ministered in Hong Kong in 1995 and 1996 to lay a foundation of teaching to reach the entire city for Christ. Through his teaching, Pastors of districts in Hong Kong networked to pray together regularly for their district to change the spiritual climate of the district through Prayer Evangelism and to minister to their district. Dr. Ed Silvoso organized one million hours of prayer for Hong Kong by intercessors in his native country, Argentina as Hong Kong was preparing to be returned to its homeland, the Peoples’ Republic of China in 1997. Since then numerous pastors and marketplace Christians went to the Annual International Institute on Prayer Evangelism hosted by Dr. Ed Silvoso in Argentina. From 2009, Pastors and Marketplace Christians have been invited by Harvest Evangelism (H.K.) Ltd to participate in the Global Conference for Nation Transformation hosted by Dr. Ed Silvoso in Hawaii. In 2002, Dr. Ed Silvoso authorized Barbara Chan, then a District Court Judge to form Harvest Evangelism (H.K.) Ltd. Barbara Chan was appointed its Executive Director. From 2002 to 2007, the focus of Harvest Evangelism (H.K.) Ltd was to teach, train and equip Christians on Marketplace Transformation. Conferences and Seminars were held where Dr. Ed Silvoso, author of Anointed for Business, Transformation and other leaders from Harvest Evangelism Inc. taught and trained Christians to walk in Marketplace Transformation in our city. A Network was formed by Barbara Chan with Marketplace Ministers in Hong Kong to support, teach, train and minister to them. From 2007 the Lord connected Barbara Chan to Mr. Nelson Leung, the CEO of The Good News Network, a network of Pastors meeting in Tsuen Wan to minister to the District of Tsuen Wan and eventually beyond. A relationship was built between Harvest Evangelism (H.K.) Ltd and The Good News Network whereby we began to work for the transformation of Tsuen Wan District, bringing many international leaders of transformation from Harvest Evangelism Inc to minister in Tsuen Wan. Signs of transformation can be seen in the District as The Good News Network embraced the principles of Prayer Evangelism to change the spiritual climate of their district. In 2009, Barbara Chan met Pastor Wong Po Ling, Senior Pastor of the Church of Christ in China, Tin Shui Wai, Covenant Church. She is also the leader of the Pastors’ Network in Tin Shui Wai. Pastor Wong Po Ling was invited to attend the Global Conference for Nation Transformation of Dr. Ed Silvoso in November 2009 held in Hawaii. Upon returning to Hong Kong, Pastor Wong Po Ling began to teach and to put into practice the transformation teaching of Dr. Ed Silvoso taught by him in his books, Anointed for Business and Transformation. Pastor Wong Po Ling and members of the Pastors Network in Tin Shui Wai began to minister to transform their district teaching the 5 Pivotal Paradigms for Nation Transformation and also the Biblical Principles of Prayer Evangelism. Through the ministry of Barbara Chan who worked with Mr. Nelson Leung of The Good News Network, and with Pastor Wong Po Ling and her team, God began to build platforms for transformation. Major Transformation leaders such as Dr. Ed Silvoso, Pastor King Flores and Pastor Brian Burton members of the Harvest Evangelism International Team, were invited by Harvest Evangelism (H.K.) Ltd to teach and train. We began to see emerging transformation in Pastor Wong Po Ling’s Church and the districts of Tin Shui Wai, Tsuen Wan and in other spheres. Harvest Evangelism (H.K.) is at present ministering to build transformation models in Districts of Hong Kong, in Churches in Hong Kong, in schools and in the Marketplace amongst Marketplace leaders and entrepreneurs, as well as in all different sectors of the city. Under the covering and leadership of Harvest Evangelism (H.K.) Ltd, the HK TransformOurWorld Network is being launched with the purpose of supporting marketplace ministers, pastors and leaders to build transformation models in their spheres of influence. 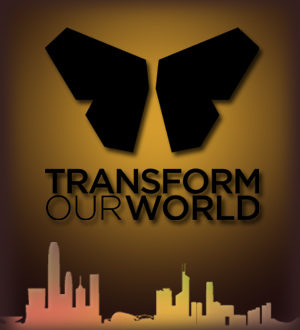 A HK Transformation DVD will be released soon to show the amazing works of God for transformation of our city. God is indeed working to bring the power and presence of God into our city and many Christians and ministries have been working to see this day happen in our city! Models of transformation in Church, in School, in Districts, in Business through walking out the Transformation Principles and Paradigms taught by Dr. Ed Silvoso, can be seen in the HK Transformation DVD which documents these! 1. The Great Commission is about discipling nations, not just people. 4. Our primary call is not to build the Church but to take the kingdom of God where the kingdom of darkness is still entrenched in order for Jesus to build His Church. 5. The premier social indicator that transformation has taken place is the elimination of systemic poverty. Ed Silvoso’s book Prayer Evangelism reveals a proven, practical action plan – one built on real-life strategies and tactics – that shows how we can change the spiritual climate of our city. It describes both “personal Prayer Evangelism” as a tool for reaching individuals (Luke 10:1-9), as well as Prayer Evangelism as a tool that changes the spiritual climate of a sphere of influence (Luke 10:1-9, 17-20) which is vital to transformation.